General Characteristics: Medium in height, well spreading, slender, maturing within 8 to 12 months, producing from 5 to 10 oha; identified by yellowish-green, widely spreading petioles and light purplish-lilac corm flesh. Petiole: 65 to 80 cm. long, yellowish-green with pinkish cast, slightly tinged with brownish-purple at apex, pinkish-lilac at edge, a dark reddish-purple ring at base with light purplish-lilac for 3 to 5 cm. above. Leaf blade: 40 to 55 cm. long, 30 to 40 cm. wide, 35 to 45 cm. from tip to base of sinus, sagittate, very smooth in outline, thin in texture, drooping, medium green, often with pinkish tinge when young; piko small, light pinkish; lobes acute with narrow sinus. Corm: Flesh light purplish-lilac with darker purplish fibers; skin dark pinkish-lilac. Inflorescence: Peduncle pale green with pinkish flush; spathe 14 to 20 cm. long, the lower tubular portion 2.5 to 3 cm. long, olive green with pinkish tinge, the upper portion deep yellow, open near constriction only upon maturity; spadix 6 to 7 cm. long, the sterile appendage 6 to 8 mm. long. 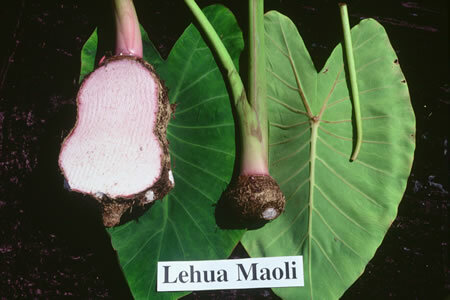 Origin, and derivation of name: Native variety; maoli means "the more common" or "ordinary." This variety is commonly known simply as "Lehua." Distribution: A favorite variety of the Hawaiians, grown throughout the islands under both upland and wetland cultures. It is the most widely distributed of the upland poi taros and is planted extensively in Kana, Hawaii. 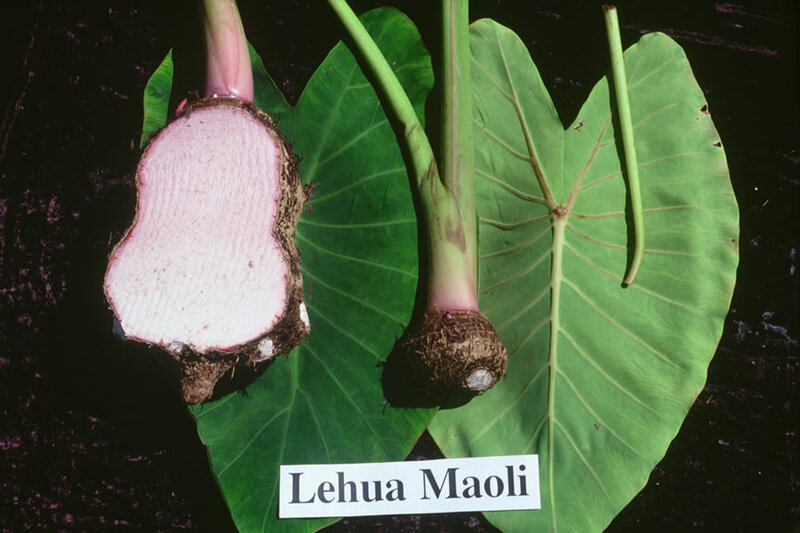 Use: The widely advertised "Lehua red poi," which often commands a premium in price, usually comes from this variety.